Editorial: Am I My Brother’s Keeper? Kamloops: The conference was bigger this year than usual. The speakers were N. Thomson, G. Williams, H. Bouwman, C. Van de Wetering, B. Funston, and J. Fitzpatrick. The ministry was very timely and encouraging, with two excellent gospel meetings. Also, the assembly enjoyed a night of ministry from Neal Thomson before the conference. Coverage of the city with Seed Sower texts was planned for the week of July 9th. Vancouver: The Victoria Dr. assembly enjoyed the visit of Eric Parmenter for ministry and gospel in late June. He also addressed a full hail for the annual Sunday School Awards Day. Acton: Helped by brethren from the Guelph assembly. Frank Sona carried on weekly children’s meetings during April and May in the high school. There was encouragement in this new outside work with 50 children and seven parents from the area attending on the final night. Please pray for meetings purposed again in the fall here where there is no testimony. Clinton: F. Sona gave an appreciated visit for Lord’s Day, May 27. J. Walmsley had three nights with the assembly in mid-June, giving appreciated ministry and an account of the work in Venezuela. The saints were encouraged by a visit Lord’s Day June 17, by A. Gratton when a young brother obeyed the Lord in baptism. A number of children and several parents attended the Sunday School picnic, June 23. Eden Grove: A. Gratton was with us for the Lord’s Day when five obeyed the Lord in baptism, most of whom were fruit from the gospel series in the fall. In the spring, brothers L. Steers and E. Doherty each spent a Lord’s Day here for the up-building of the saints and teaching for new believers. The recent conference was well attended with four of the Lord’s servants present and with timely ministry. Milton: The assembly appreciated one week of ministry on Abraham by Timothy Walker. North Bay: The Nipissing Junction assembly enjoyed a meeting with D. Rodgers for ministry and an account of the work in Chile. D. Booth visited for a Lord’s Day during which a woman professed salvation after the gospel meeting. The conference in June proved very encouraging with thirteen of the Lord’s servants present to share in the ministry. The Bible Readings on Restoration and Revival were excellent and the help of God was evident in the ministry, gospel, and testimony as well. We look forward to a baptism of a young sister and brother on June 24. Thunder Bay: A. Hull and D. Gilliland visited on June 10 and also visited Kapuskasing. Portage la Prairie, Winnipeg. and Sault Ste. Marie for ministry and gospel that was much appreciated by the saints. A. Dryburgh was here June 13 for ministry. Victoria Road: The saints were refreshed with two weeks of children’s meetings with E. Miller in April, and by recent visits from B. Rodgers, E. Badgley and A. Adams. Our June conference was well attended and encouraging ministry was enjoyed from nine servants of the Lord. Bathurst: Gospel meetings with J. Walmsley in English and a local brother in French are planned for August. Fairisle: As a follow up to the interest during meetings in Tracadie, L. Wells started tent meetings in this village situated approximately 30 miles from Tracadie on July 3. Shediac: The assembly is presently in their sixth week of gospel meetings. The local brethren started on their own and L. Buote has been with them for the last four weeks. Several unsaved are attending and God has blessed in salvation. Tracadie: Seven weeks of gospel meetings with L. Buote, L. Wells, and a local brother closed on June 10. A few strangers attended for the first time with interest and the Lord gave encouragement to the assembly. Visits from J. Walmsley and S. Wells in June were appreciated. Halifax: The Bible Reading conference was well attended. Six brethren opened readings on Matthew 26-28, linking the four Gospels together in a devotional and practical study of the events of the sufferings, death, and resurrection of the Lord Jesus. Nineveh: The assembly had an appreciated visit from S. Wells for one night of ministry. Parshoro: A. Hull has a tent pitched in this new area. He is being helped in the meetings by Matthew Cain of Halifax. Pugwash Junction: The conference on the first weekend in July was large and God gave much help in the ministry of the Word and the preaching of the gospel. Two Bible readings on 1 Cor. 15 were very much enjoyed. Sydney Mines: Our conference June 2-3 was profitable with some 150 in attendance. Seven of the Lord’s servants gave excellent ministry and sound gospel was proclaimed on both nights to large audiences with a number of unsaved present. S. Wells led the Bible reading on Psalm 22 on Lord’s Day and also stayed for a ministry meeting on Monday night. Borden: JA. Joyce and P. Ramsay have pitched a tent and began gospel meetings on July 1. Corner Brook: The annual conference June 23-24 was very profitable. N. Crawford and J. Jarvis gave valued ministry, along with help from local preachers. A good number of the Lord’s people are sick in the province with much prayer being made at the conference time. This was the 50th anniversary of the Corner Brook assembly, and JA. Joyce gave a report of the early days of the assembly. Gander: In June, N. Crawford had a week of encouraging and enlightening ministry using a chart on the Book of Zechariah. Goose Bay: W. Buckle, with the help of local believers, is planning a Seed Sower’s distribution in the area while having children’s meetings in early July. followed by possible gospel meetings. Grand Falls-Windsor: Gospel tent meetings started on July 8 in a supermarket parking lot with M. Derksen and B. Joyce, preceded by distribution of Seed Sower texts on June 30. G. Whey, with help from other brethren, planned to use the open air trailer in the surrounding towns of Botwood, Bishops Falls, and possibly Badger to help to advertise the tent meetings. Please pray for the blessing of the Lord. Main Point: Alvin Blake has had a number of gospel series in Newfoundland and was commended last November. Our dear brother has been diagnosed with cancer and needs our earnest prayers for himself, his wife, and for some of his family who are unsaved. Red Bay: J.A. Joyce was with the assembly for a weekend and took the ministry meeting in the afternoon. Seal Cove: In August, G. Whey of Gander and Charles Hiscock of St. John’s plan to use the open air trailer in various locations near the assembly here. St. John’s: N. Crawford had a week of very needful and profitable ministry on Assembly Truths from June 18-21. Marysville: Gospel tent meetings are planned for mid-August with D. Booth and T. Hoy speaking each evening at 7 p.m.
Fresno: The assembly appreciated gospel tent meetings the first two weeks in June by C.Van de Wetering and J. Fitzpatrick. The tent was pitched in an area where many Sunday School children live. The meetings were well-attended by the children as well as a nice number of strangers. San Diego: J. Baker of Scotland paid a visit to the assembly in July with ministry that was a real help and encouragement to the saints. Phoenix: The Sunnyslope assembly continues to help in the West Phoenix Spanish gospel work. J. Dennison and S. Kember, Jr. continue gospel meetings into the 7th month with good interest and the Lord continues to bless in salvation. J. Dennison and family are moving to this area to be closer to the work. There is an open door for the gospel, a respect for the Word of God and willingness to listen. Recently a large crate of clothing and housewares from the Hatboro, PA assembly was distributed. This was greatly appreciated by the new believers and others that attend. There are great spiritual and material needs among the more than half million Spanish speaking residents of Phoenix. The assembly also appreciated ministry earlier this year from brethren Slabaugh, Beattie, and McColl. Langdon: A. Christopherson and R. Weber have been having gospel meetings here. Rapid City: A. Christopherson, with help from D. Barney, is preaching in a tent in this new area where he has worked a number of times and seen blessing in salvation. Sandstone: Gospel meetings started June 13 in connection with the Hinckley assembly. R. Orr and E. McCullough are the speakers. The rainy weather has made it difficult but they have been encouraged with some attending. Hitesville: On June 3, eight were baptized on the Lord’s Day afternoon bringing joy to the saints here and to those baptized. We also appreciated a night of ministry by J. Smith in June. Littleton: Please pray for tent meetings with R. Weber and J. Jennings beginning July 8. Kansas City: E. Fowler was with the saints in April and J. Portman in May for ministry that was very profitable and encouraging to all. Alpena: In May and June, J. Portman, H. Rodrigues, and P. Thiessen gave much help in English and Spanish meetings at the hall and in home meetings. This area has one of the fastest growing Spanish populations in the U.S.
Blue River: J. Smith was here for four nights of ministry after the Garnavillo conference. East Troy: In fellowship with the Waukesha assembly, gospel meetings have commenced in a rural schoolhouse near here with S. Wells and W. Skates. The surrounding villages have been visited with invitations and tracts, and a few have come along from the very first night. Lancaster: F. Krauss had a week of children’s meetings in connection with the Beetown assembly. Sparta: J. Jennings and C. Erickson (LaCrosse) are in the 5th week of tent meetings, with blessing and interest. Akron: The assembly appreciated visits by W. Metcalf, R. Surgenor, and D. Oliver. Clyde: R. Surgenor visited here and gave helpful ministry. Cleveland: W. Gustafson gave encouraging ministry on a recent visit. Bryn Mawr The assembly enjoyed a visit for a Lord’s day from P. Ramsay with appreciated ministry. Hatboro: Well-attended tent meetings concluded with D. Oliver and P Rainsay The Lord blessed with salvation. A good number of contacts were made and many strangers attended. An afternoon ministry meeting was held on the last Lord’s Day. The assembly was encouraged with the meetings. Augusta: The conference was a time of encouragement. The Bible readings on the Perfect Servant in His service (Isa 42) and in His submission (Isa 50) set the tone for the ministry. W. Gustafson, S. Wells, W. Bingham, D. Oliver, and A.J. Higgins gave help. Madawaska: The assembly had a week of gospel meetings, hoping to reach some unsaved relatives. Hardwick: On Lord’s Day, June 10, K. Taylor paid the assembly a very welcome visit. Methuen: The saints appreciated visits from A. LeBlanc and K. Taylor in May; P. Orasuk, J. Procopio, S. Wells and W. Seale in June. Saugus: A good spirit prevailed throughout the two days of practical Bible readings at the beginning of June, on “Living for Christ in a World Opposed to Him.” Eight of the Lord’s servants contributed. The rich fellowship of believers was most encouraging to the assembly. W. Gustafson visited for a night of ministry in May and S. Wells in June. Watertown: The recent baptism of a young sister from the assembly here brought much joy to the believers. F. Tornaquindici and W. Seale were with us for this occasion. Several unsaved were present and many from the area assemblies attended. Worcester: The saints were encouraged to have brother W. Gustafson with us on June 21. Brookfield: The assembly concluded an encouraging series of weekly children’s meetings recently. H. Clark, D. Oliver, and B. Brescia visited during the series as guest speakers. A good number of children and some parents were present. The assembly purposes to have a week of children’s meetings in late August and desires the prayers of the saints. Newington: The assembly enjoyed a week of ministry with A. Dryburgh on the book of Ruth. Terryville: A. Dryburgh visited for a ministry meeting and led the area monthly Bible Reading. September 2 and 3 in the Gospel Hall, 4603 E. Linwood Blvd., Kansas City, MO 64128, Tel: (816)924-6346. Prayer meeting on Saturday at 7p.m. Sunday: Bible Reading 9:30 am. (John 17), Breaking of Bread 11 a.m., Ministry 2 p.m., Gospel 7 p.m. Monday: Ministry 10 a.m., Gospel 6 p.m. Corr: William L. Jackson, 1613 Ashland P1, Blue Springs, MO 64015, Tel: (816)228-3591. September 8 and 9 in the Hartman Avenue Gospel Hall, 69th and Hartman, preceded by prayer meeting on Friday 7:30 p.m. Meetings begin Saturday 10 am. Bible Reading on Lord’s Day will be on Phil. 2:5-11. For further information or accommodations, please contact James Harvey, 3139 N 126th St., Omaha, NE 68164-5204; Tel. (402)4989005; e-mail: jjharvey@home.com, Hall (402)571-5983. September 1 and 2 with prayer meeting Friday at 7:30 p.m. All meetings will be in the Gospel Hall, Cor. Wellington and Spring Streets. Order of meetings will be Saturday 10 a.m., 1:30, 3:30 and 7 p.m.; Sunday 10:15 a.m., 1:30, 3:30, 7 p.m. Bible Reading both days will deal with the subject of Prayer. Saturday evening meeting will be devoted to ministry for young believers. Corr: R.A. Clark, 462 MacDonald Ave., Sault Ste. Marie, ON P6B 1H9, Tel. (705)759-0968. September 8 and 9 with prayer meeting Friday 7:30 p.m. in the Gospel Hall, 153 Cherry Street; while all meetings on Saturday and Lord’s Day will be in the Hardwick Elementary School gymnasium, junction of Routes 14 and 15. All 3 meals will be served Sat and Sun starting with Sat. breakfast at 9 AM. First meeting on Sat. at 10 AM; Lord’s Day breakfast at 8:15 with Breaking of Bread meeting at 9:30 AM. Advance notice of accommodation needs is requested to Bill Scott, 438 Dimick Road, East Hardwick, VT 05836-9634. Telephone (802) 472-6257. September 15 and 17 in the Aplington-Parkersburg Middle School, 215-10th Street, Aplington, IA with prayer meeting on Friday, September 14 in the Hitesville Gospel Hall, Rural Route, Aplington, IA. Order of meetings on Lord’s Day: Bible Reading 9:00 a.m. (Acts 10:34-43), Lord’s Supper 10:30 am. Corr: Dr. Larry L. Brandt, 509 Lincoln Street, Box 683, Parkersburg, IA 50665-0683, Tel. (319)346-1084, Hall (319)347-2333, School (319)347-2394. September 22 and 23 in the Chapman Valley Gospel Hall. Prayer meeting Friday 7:30 p.m. with supper served 5:30-6p.m. Bible Reading, Saturday 8:45 a.m. Subject: Priesthood of Believers. Lord’s Day Bible Reading subject: The Priesthood of Christ. Chapman Valley corr: Herb West, Box 870, Sundridge, ON POA 1ZO. Tel. (705)384-5280. Parry Sound corr: Tom Hulcoop, 9 Edward St., Parry Sound, ON P2A 2W5,Tel. (705)746-5919. September 29 and 30 in Central Huron Secondary School, 165 Princess Street East. Prayer meeting Friday 7:30 p.m. in the Gospel Hall, 143 Joseph Street. First meeting on Saturday for ministry 10:30 a.m.; Lord’s Day, Breaking of Bread 10 a.m. Bible Reading subjects will be announced in September magazine. Corr: Douglas McDonald, P.O. Box 329, Clinton, ON NOM 1LO, Tel. (519)565-2752, Hall: (519) 482-8687. September 29 and 30 in the Gospel Hall, 61 Prospect Street, with prayer meeting on Friday at 8 p.m. Breaking of Bread at 10 a.m. Corr: Edgar Chambers, 303 Huntington Court, Wyckoff, NJ. 07481-2955, Tel: (201) 652-4862, Hall: (201) 447-0654. October 6 and 7 in the Legion Hall, 111 Main Street, Maidstone. Prayer meeting on Friday 7 p.m. in Maidstone Gospel Hall, 41h Avenue and Main Street. Meetings both days at 10:30 am., 2 and 7 p.m. Corr: Harry McLaren, Box 481, Maidstone, SK SOM 1MG, Tel: (306)893-4614; Lennard Heath, Box 274, Turtleford, SK SOM 2Y0, Tel: (306)843-2627; or David Flint, Box 35, Paradise Valley, AB TOB 3R0, Tel:(403)745-2560. October 6 and 7, with prayer meeting at 7:30 p.m. on Friday in the Gospel Hall, 1 Sunset Drive. All other meetings will be held in the Parkside Collegiate, 241 Sunset Drive. Saturday: Ministry 10:30 am, and 2 p.m., Gospel 7:30 p.m. Sunday: Breaking of Bread 10 a.m., Ministry 2:30 p.m., Gospel 7:30 p.m. Corr: Lyle McCandless, 45 Pol Crescent, St. Thomas, Ontario N5R 5P9, Telephone (519) 637-1602. School (519) 633-0090. October20 and 21, with prayer meeting on Friday at 7:30 p.m. in the Gospel Hall, 36 North Main Street. All other meetings in the Harry S. Fischer School on North Main Street, 1/8 mile north of the Hall. Saturday: Ministry 10:30 a.m. and 2 p.m., Gospel 6:30 p.m. Sunday: Breaking of Bread 10 a.m., Ministry 2 p.m., Gospel 4:30 p.m. Accom: William Batterton, Tel: (203)755-7621. Alvin Blake, P.O. Box 2, Main Point, NF AOG 3G0. St. Thomas, ON: Breaking of Bread has been changed from 10:00 to 9:45 am. Mrs. Annie Robertson of Sydney Mines, NS on December 20,2000, age 101. Our beloved sister left a clear and faithful testimony to the end. She is survived by son Bobby (Yvonne) Robertson and daughter Agnes (Junior) MacDonald, both in assembly fellowship. Ken Taylor and Norman MacQueen conducted the funeral service in the Gospel Hall. John MacDonald assisted at the committal service. Ann Graves of Arlington, WA on May 19, age 96. She was saved at 32. She and her husband Lynn, who preceded her to glory in 1975, were in the Okanogan assembly for many years. In recent years, Ann was lovingly cared for by her only daughter and son-in-law, John and Floy Klein. While health permitted, she faithfully attended assembly activities, and her ready smile will be missed. Her memorial service in the hail was taken by John Klein and Charles Klein of Okanogan. Four of her grandsons spoke briefly of their memories of her. She leaves 20 grandchildren, 33 great-grandchildren and six great, great-grandchildren, many of whom attend assemblies in this area. George W. R. Hubley of Nineveh, NS, on May 27, age 82. Our beloved brother was saved in 1948, baptized and received into assembly fellowship at Clementsvale. After several years, he moved to the Nineveh assembly, where he was an elder until his death. George had a love for the assembly and the the gospel, having labored in Weaver’s Settlement. His funeral was well attended, with the gospel plainly preached by A. Hull, G. Roy, and Win. Bingham at the grave. He was predeceased by his first wife Sadie (Maling). He is survived by wife Joyce (Aptt), four sons, and one daughter, two of whom are in assembly fellowship; also ten grandchildren. Andrew Hall of San Diego, CA on June 10, age 83. Our dear brother came to Toronto from Belfast in 1948. He was saved in 1949 and moved to Detroit with his family. In 1969 they moved to San Diego. He was correspondent of the assembly for a number of years, and was a faithful and beloved brother. He is survived by two sons and their families. Gordon J. McIntosh of Lake Shore, ON, on June 13, age 82. Our brother was saved in 1934 when the late L. McBain and A. Klabunda had meetings in Glen Rae. He has been in the Lake Shore assembly since 1943, always having a care for the welfare of the assembly. Being a carpenter, he took much of the responsibility for the building of the new hall in 1979-80. He is survived by his wife Helen, family of four, eight grandchildren, and four great grandchildren. The hall was filled to capacity for the funeral, with many from the community attending. It was taken by Win. Metcalf, L.Langfeld, and son Douglas, with brother-in-law Bruce Fuller at the graveside. Ronald Yade of Welland, ON on June 24, age 73. Our brother was diagnosed with a brain tumor which advanced rapidly taking his life in two months’ time. His seat will be empty and he will be missed. He and his wife Laura (Boies) were in happy fellowship in the assembly at Welland. The large attendance at his funeral gave witness to his good testimony as a believer. James N. Smith spoke words of comfort and searching words in the gospel at the service. Ronald’s brother Lome gave the eulogy. Pray for his widow Laura and their two children, Cheryl and Russell, who are saved and have children still out of Christ. 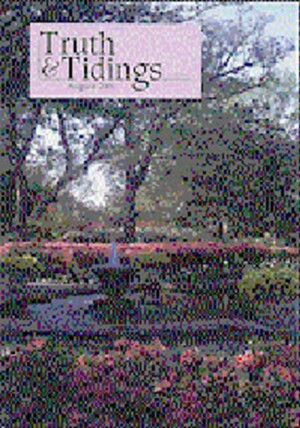 “Things Written Aforetime” is 91 pages of clear, excellent devotional teaching on the Tabernacle, its furniture, altars, vessels, and service. There is much needed teaching on the priesthood and worship. This book contains 14 illustrations from a model of the tabernacle. “The Seven Churches of Asia” contains 113 pages of very practical teaching. The churches are viewed as actual assemblies and the Lord’s words to them are applied to present needs and dangers. The book is well written and contains helpful illustrations. Robert E. Surgenor, 4527 W. 226 St. Fairview Park, OH 44126-2513. Phone (440) 734-1942, EMail surgl928@aol.com. Cost, $2.50 each, postpaid if at least 3 of each are ordered. Higher for a single copy.